Now you need another two bamboo skewers. The photo shows them laid over the sail, after being snipped to length with scissors. 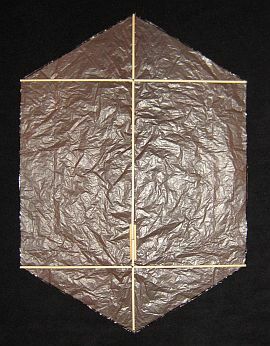 Lay down the glued skewers over the center crease of the plastic, lining up the non-pointy end with the top corner of the plastic. Snip off the other end so the skewer lines up with the bottom edge of the plastic as well. As already mentioned, this is the vertical spar. Lay down another skewer across the top left and right corners of the sail, and again snip to length, removing the point. Also make an easily-seen mark on the skewer at the exact center-point. This is the upper horizontal spar. Lay down another skewer across the lower left and right corners of the sail. Snip, mark and indent just as you did for the upper spar. This is the lower horizontal spar. Lay down the vertical spar skewer over the sail, and wrap a short length of clear sticky tape around each tip, securing them to the top and bottom corners of the sail. The top photo shows the top tip in close-up. Lay down the upper horizontal spar skewer and attach its tips to the left and right corners of the sail, in the same way. Now do the same for the lower horizontal spar skewer. Dribble some wood glue all around where the skewers cross each other. See the bottom photo. Cut off some 20 pound bridle line to a length of 2.0SL (58cm, 23"), and tie a very small Loop Knot into each end. See the photo. 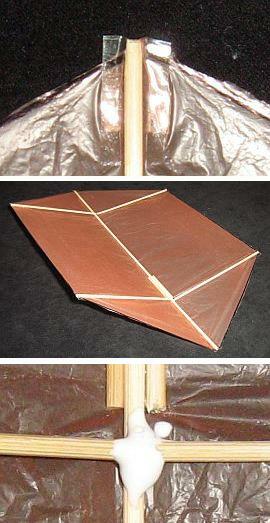 Poke a hole in the plastic sail, just above where the upper horizontal spar crosses the vertical spar. 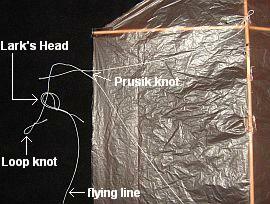 Poke another hole in the plastic sail, just below where the lower horizontal spar crosses the vertical spar. Poke the Loop Knots through the holes and tie off around the vertical spar with a Double Wrap Slip Knot. 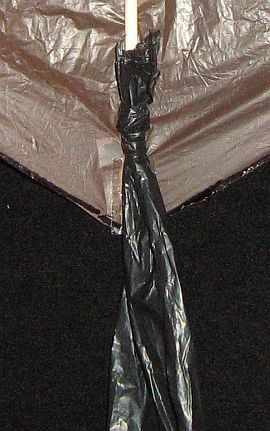 Tie one end around the vertical spar, as close as possible to the bottom tip. See the photo. A single Half Hitch will do, since there are very low forces on the tail in flight. Snip off the excess plastic so the knot is neat and tidy. At this point, you've finished making the 1-Skewer Rokkaku! 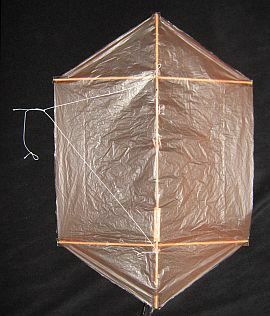 To attach the flying line, just Lark's Head the flying line to the short kite line as in the photo.